Here I am back in Paris visiting with my Mom. The wind is icy under a limpid sky and as I wrap her in soft woolens before stepping out (shawl, blanket, scarf, hat, gloves and mittens), I remember snowy winters long ago when she helped me bundle up my toddlers, neither of us suspecting that one day I’d be doing the same for her. 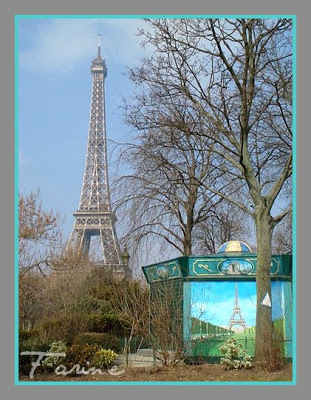 She likes to go check on the Eiffel Tower – which was built in 1889, the year her father was born. So that’s what we do: we start our tour by paying our respect to the Iron Lady (the Awful Tower as one of my grandsons, then 5, thought it was called) and then we patrol the streets. I hunt for bakeries. 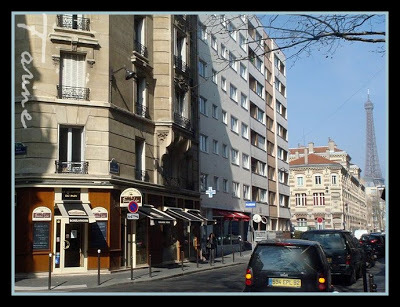 She doesn’t mind: as often as not she likes what she sees in the window display and we decide to go in and buy a tart or an éclair for her afternoon snack. Even though she is less and less interested in the actual act of eating, she enjoys holding on to the delicate paper dome that houses her pastry and actually looks forward to having a bite later. 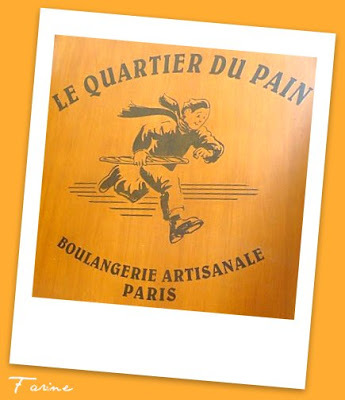 Today our walk takes us to Le Quartier du pain, 74, rue Saint-Charles in the 15th arrondissement. 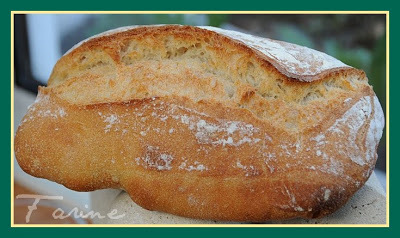 The bakery is owned by Frédéric Lalos, a master baker who won the title of Meilleur ouvrier de France, aka MOF (Best Artisan in France) in the bakery category at age 26. I own his book, Le Pain, l’envers du décor (a French-English edition) (although I haven’t baked from it yet). 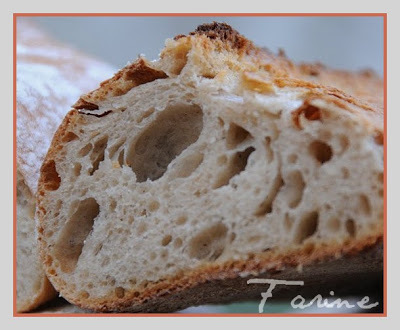 I had been curious to taste Lalos’ bread ever since I heard a friend of mine, who is passionate about baking (she is in her second year of baking school in Paris), rave about it. So we went in. I bought a pavé au levain and a longuet as well as two small tarts: pistacchio-cherry and chocolate. 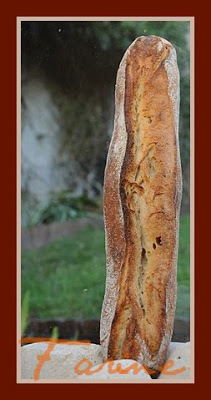 The longuet (currently the bread of the month) is fermented with a wheat- and dried buckwheat (sarrasin séché)- levain. 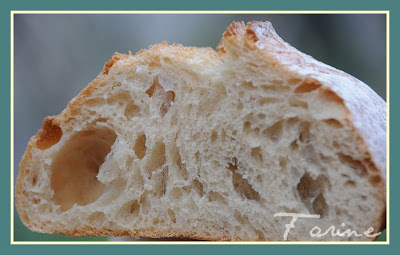 It is crisp, airy, fragrant and rustic, utterly delicious, a true “signature bread”. It will be a pleasure. 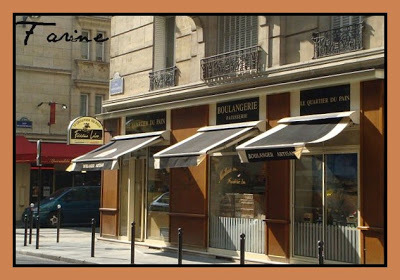 Le Quartier du pain is one of these blessed bakeries where the customer peeking beyond the shelves can actually see the mixing, the shaping and the baking. Also it features something which is a first for me, i.e. a machine with a big slot into which the customer inserts coins for payment. Change is automatically dispensed. Since most people use coins to pay for their baguettes, I suspect that, hygiene-wise, this is a big step-up and I like the fact that it matters so much to Lalos that he went to the trouble. Aging is tough. I am glad you are visiting your Mom again. I'm looking forward to more tart updates. The one you've posted about was amazing. I've printed it, but will wait before I attempt it. Thank you for this post, I tend to get impatient with my Mom sometimes and then feel so badly. It's so heart wrenching to see those who so dearly nutured us slowly recede from their pasts. A bittersweet journey, indeed. I know you cherish the time you have with your Mom, and I know she must be comforted in your presence. 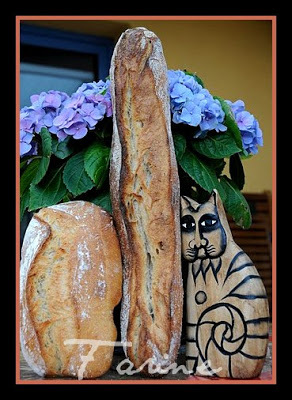 Your kitty bread photo is wonderfully whimsical. I'll bet it made your Mom smile. Touching post. I loved the Awful Tower thing… lol. @Esther, I will definitely post a tart recipe when I get back, maybe the one with pistachio frangipane? @LindyD, it did! Thank you. I have the book you mentioned in your post. It is always nice to visit the bakery which has a bread book. 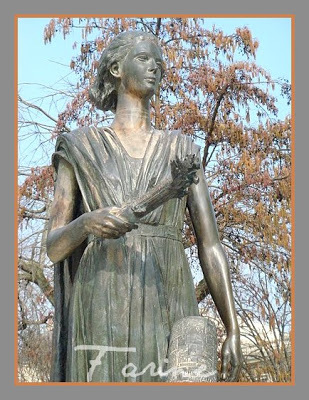 Sometimes we say it is nice to finally meet someone who we have communicated with over telephone calls or emails. To me, going to the bakery whose owner baker has published a book is like meeting the actual baker. Always very intereting. 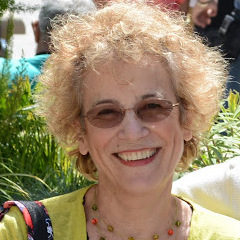 I recently read a very nice article about what we can do with our aging parents – to ask them and to listen to their story about their youth. I guess when they are old, the best thing we can give them is our "time" and you are most certainly giving your best! Really hope i'll be working there next year!